Girona (Barcelona) just over the Spanish border is 2 hrs 15 minutes. The A9, A61 and A75 motorways connect the Languedoc region to the rest of France and Europe. The best exits for Arc-en-Ciel in Faugeres are: A9 from the East Exit 34 A9 from the south: Exit 36? from the north: Exit 59 A75 from the south: Exit 60 Whichever direction you are coming from, head towards Pézenas and then pick up the signs for Bedarieux. 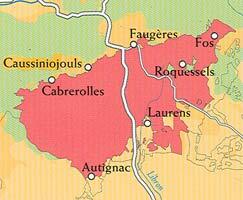 At Faugeres continue towards the centre of the village and you will go over four sets of speed bumps then up up the hill .You will see us on the left hand side, look for 376 on a yellow pillar we have green gates.If you get to the Bel Air Restaurant you have missed us! We recommend that you rent a car when you reach your destination. Car rental can be arranged at airports and train stations, but best to book in advance. The TGV is a wonderful way to travel and the high speed line stops at Montpellier. However you can continue your journey on to Béziers (our nearest station), you just won't be whizzing along as this part of the line is yet to be upgraded. You can also hire a car at either Montpellier or Béziers stations. CLICK HERE to view timetables for the TGV service and make a booking.